Our quilt-making foremothers used fabric scraps from sewing clothes to make quilts. 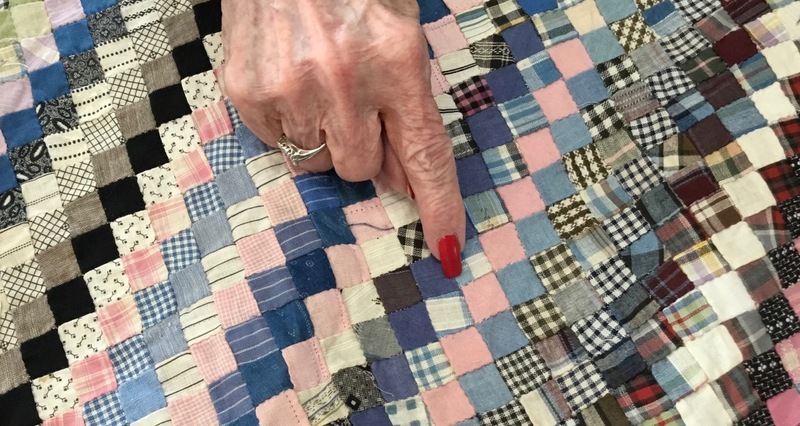 The clothing came first... then came the quilts. 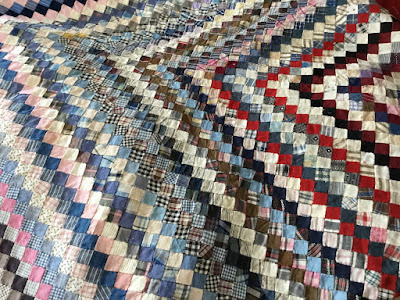 As quiltmakers, we naturally look at the cotton fabrics found in quilt shops from the viewpoint of making a quilt. 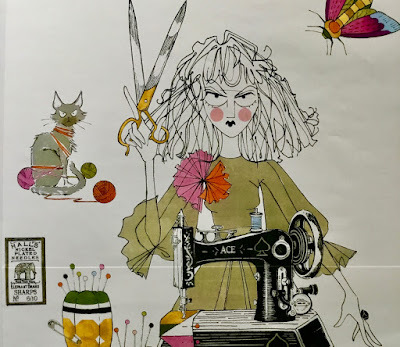 But there are a lot of quilters who began sewing clothing—for themselves or for family—and ventured into quilting later. So, why don’t we look at those same bolts of cotton prints with a garment in mind? Good question! Let’s change that way of thinking. 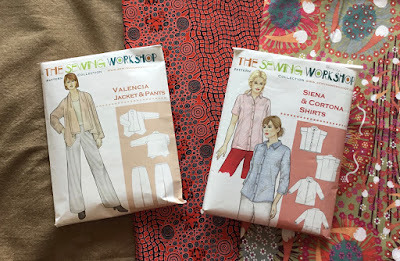 Valencia Pants and Siena Shirt patterns from The Sewing Workshop. Cotton fabrics from Diamond Textiles (left) and M&S Textiles Australia (center and right). For Christmas, I received a wonderful gift from my husband. 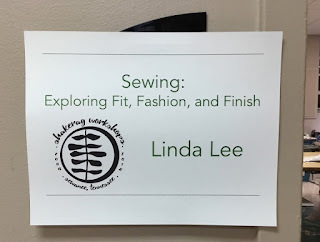 It was a workshop called “Exploring Fit, Fashion and Finish” with Linda Lee, owner of The Sewing Workshop. It was fabulous (the gift and the workshop)! 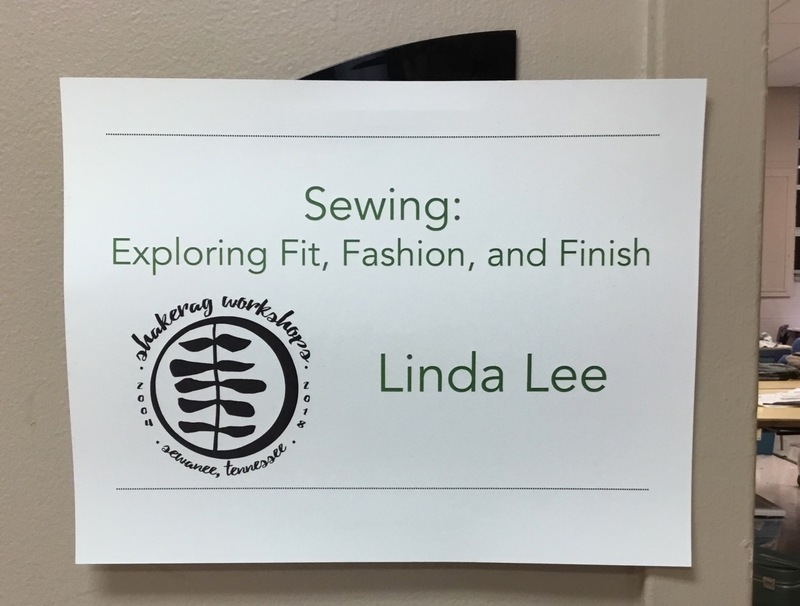 2018 Shakerag workshop with Linda Lee. Not knowing exactly what might inspire me on this sewing adventure, I filled a suitcase with various fabrics—all cottons that can be found at most any quilt shop—packed my sewing machine, serger and a handful of matching threads and proceeded to the workshop... to explore garment possibilities under the guidance and tutelage of Linda Lee, a renowned sewing expert. 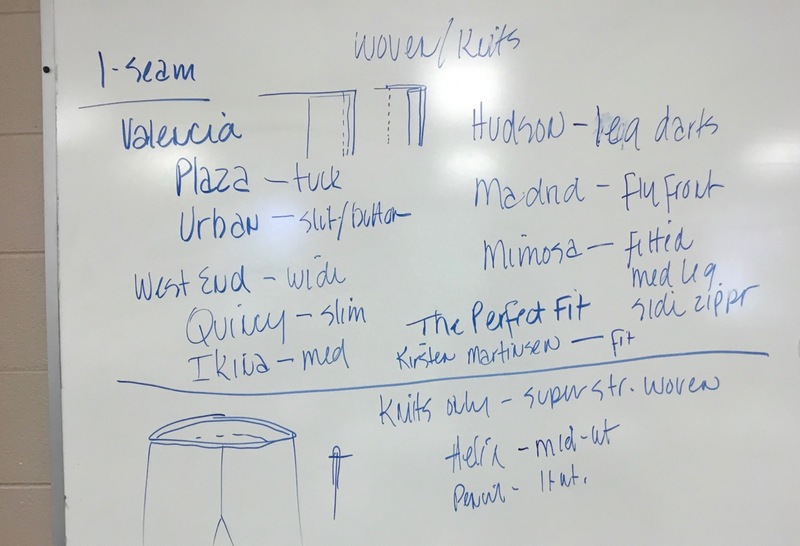 Overview of pants patterns available from The Sewing Workshop. My first goal, as was with many of the workshop attendees, was to fit a pant patten and make pair of pants. 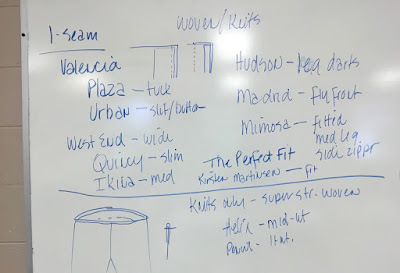 After Linda reviewed the features of all the pant patterns from The Sewing Workshop, I chose the Valencia Pants. It is a one-seam pant with a flat front and a partial elastic waistband. A good beginner pattern. 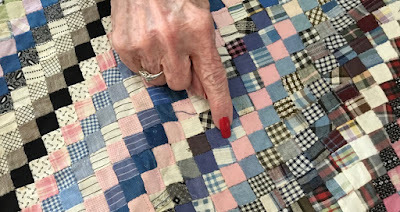 My fabric choice was a yarn-dyed woven from Diamond Textiles. 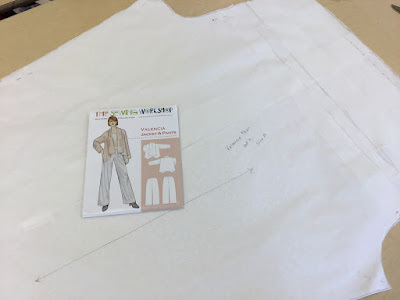 Laying out the Valencia pants pattern. I made the pants in one day and wore them the next. Valencia pants. Yarn-dyed cotton from Diamond Textiles. I added my must-have pockets with a contrast fabric piping detail. The pockets actually took longer to make than the pants themselves—really! I drafted a pocket pattern for my Valencia pants. The next project for me was a top. 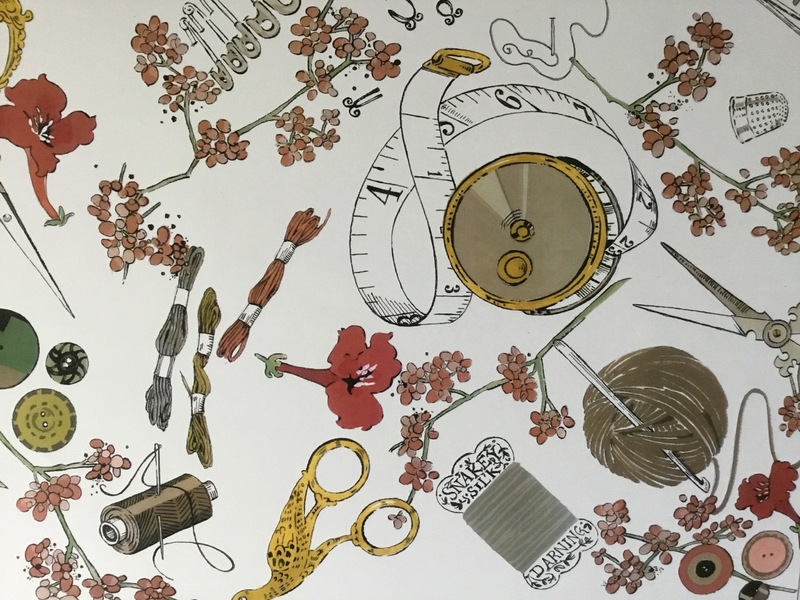 In analyzing the schematic drawing for the Siena Shirt, this pattern lent itself to using either a single fabric or multiple, coordinating prints. 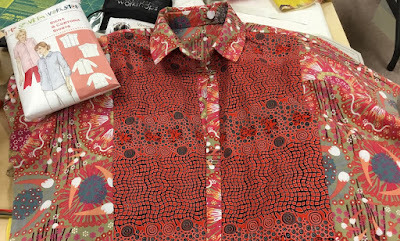 My table mate, Alice, suggested combining these two prints from M&S Textiles Australia, Fire Dreaming (center front) and Plum and Bush Banana (front band, collar and side panels). The Siena Shirt (from The Sewing Workshop) with fabrics from M&S Textiles Australia. 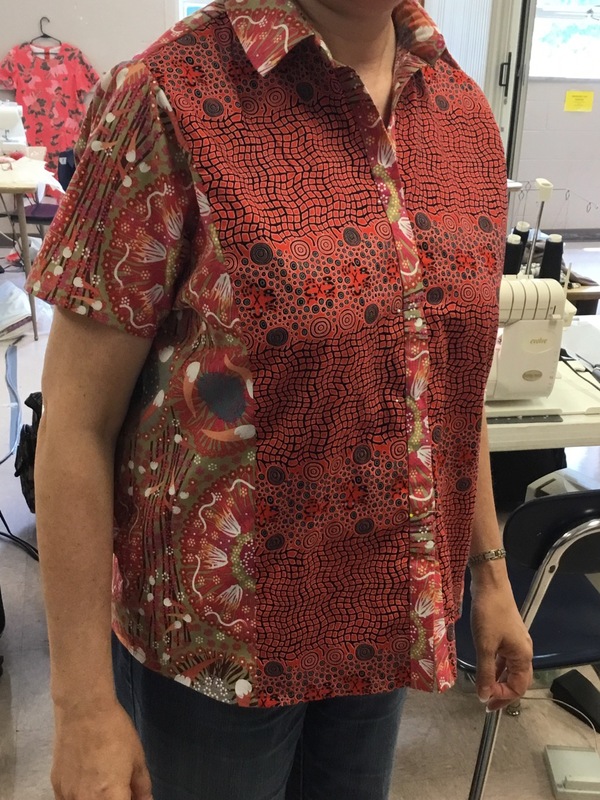 Here is a photo of the first try-on of my new Siena Shirt. The buttons and buttonholes need to be added and then it will be ready to wear. The fabric is soft and has good body and drape for this style of top. First try-on of the Siena Shirt. many of the garments can be made with either wovens or knits. This makes them very versatile. many have multiple garments included in a single pattern envelop (pants and a coat, two different shirts, a sweater and a tank top). This makes them a great buy! finishing details are included in the written instructions at the corresponding step of the construction process. the patterns are sized and graded for "real" women. 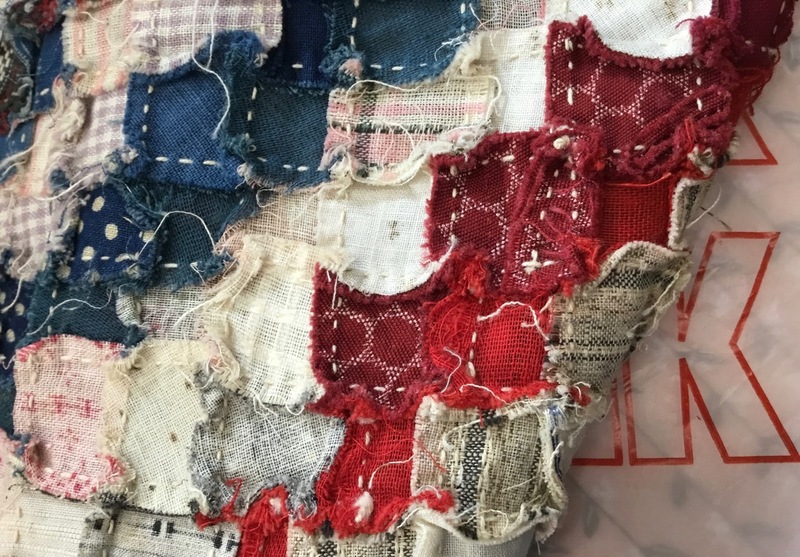 There were workshop participants of various sizes, shapes and maturity and several of them made pieces using the same pattern. The garments were appropriate, looked good and fit everyone. 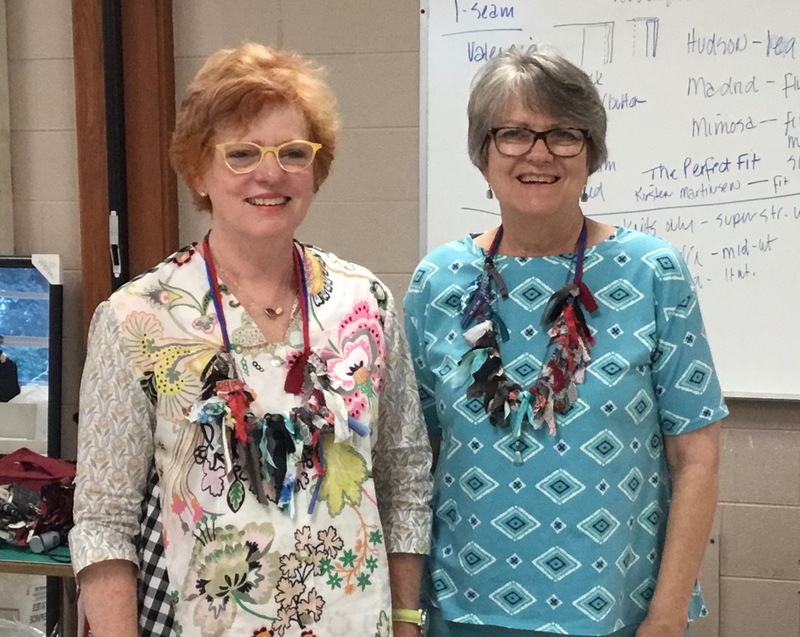 Linda Lee (left) and workshop assistant, Diane Hall. 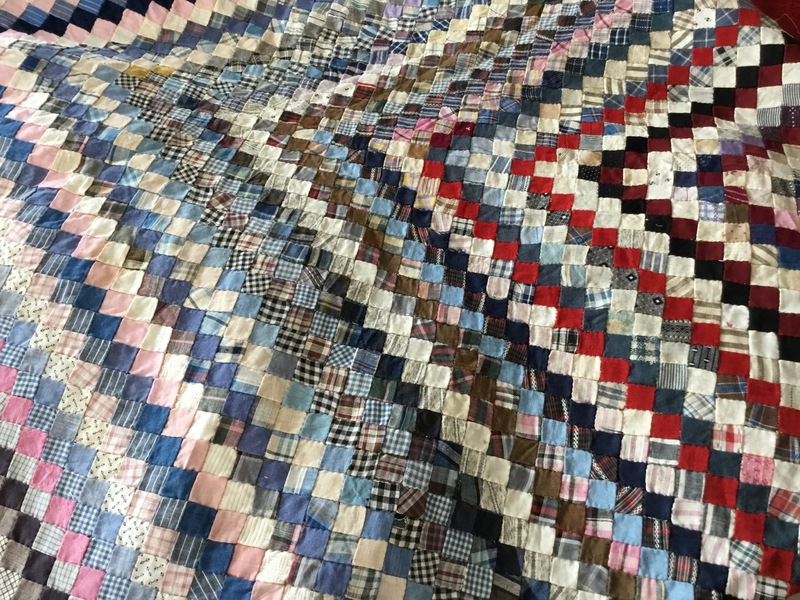 Take a spin on The Sewing Workshop website and think about using cotton quilting fabrics for clothing with these patterns. You might be surprised how nicely they work together. I've used fabrics from Diamond Textiles, M&S Textiles Australia and Art Gallery for garments, but there are others you might try. Thank you to our talented, funny and generous instructor, Linda Lee, the workshop assistant, Diane Hall, and my fellow classmates for an inspiring, informative and enjoyable sewing workshop. My sewing machine, serger and a pile of quilting cottons are ready to go! 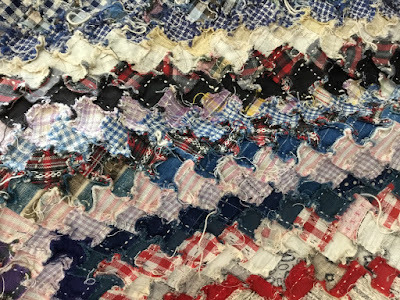 The Postage Stamp quilt—a scrap buster project if there ever was one. Antique postage stamp quilt top. Patches are finished to 1/2 inches square. I was visiting Margaret at Quilt Connection [Murfreesboro, TN] last month and she said, "Veronica, I have a quilt top you might want to see." She was right! 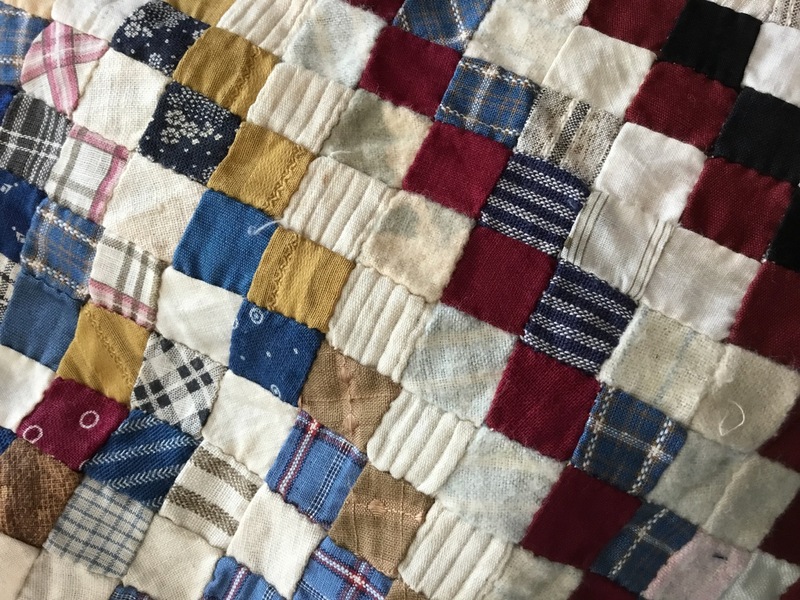 Antique postage stamp quilt top. 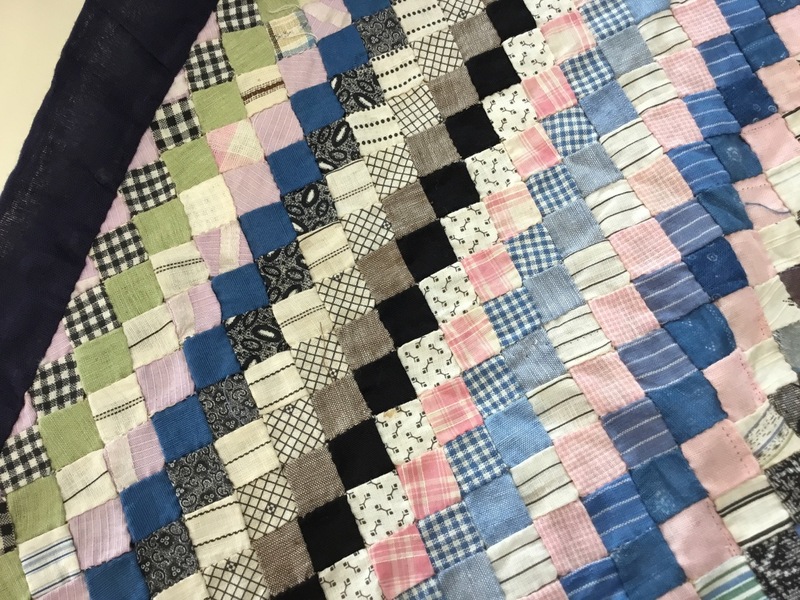 Even though this postage stamp quilt—a name given to this type of quilt pattern because all the patches are about the size of a postage stamp—is a scrappy quilt, you can tell [she] had a design plan. Standing at a distance, you can see the concentric dark/light rings. 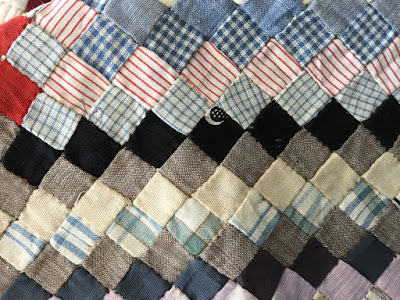 The outside rows of the postage stamp quilt. 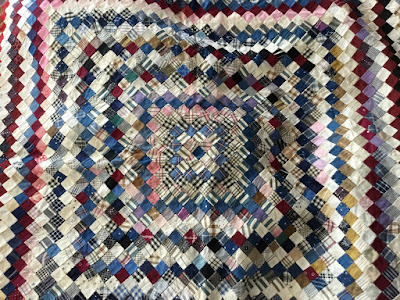 The precision of the hand piecing is amazing. These are 1-inch squares that finish at 1/2-inch. 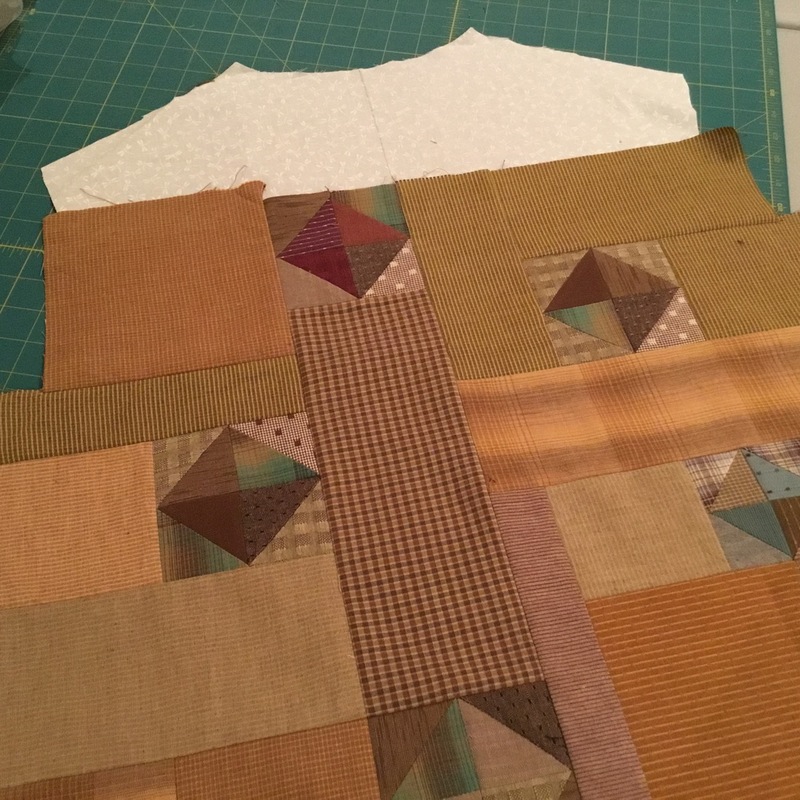 Patchwork squares finish at 1/2 inch. Fabrics: cotton prints, yarn-dyed, shirtings, flannels. Don't you love the moon from a novelty print peeping out of this patch? 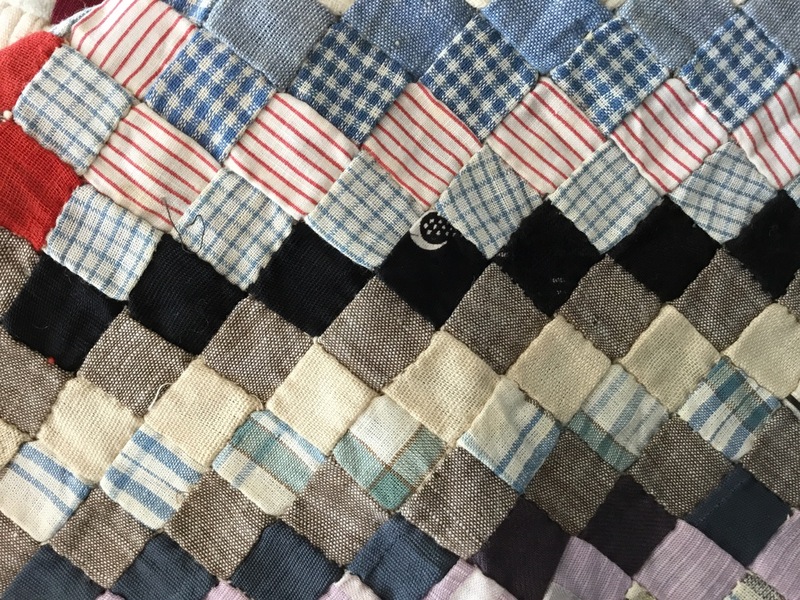 Here is a reference of the size of the patchwork. Look at the size of these pieces! Every piece was not on grain, but this quiltmaker was persistent in her workmanship. 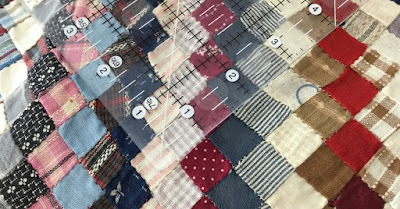 And she even pieced some of the 1-inch pieces (see the red squares)! Some of these small patches were even pieced. 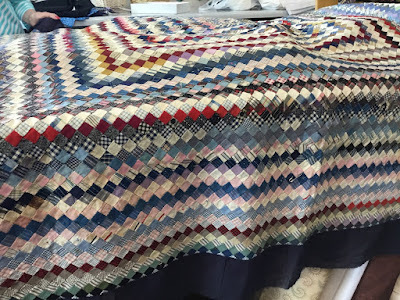 Realize this is all hand pieced! Back of the postage stamp quilt top. Hand pieced. I don't remember what Margaret said the size of the top was, but you can see it would cover a bed. Lots of tiny pieces! This quilt top reminds me of the story about the 1863 Jane A. Stickle quilt. 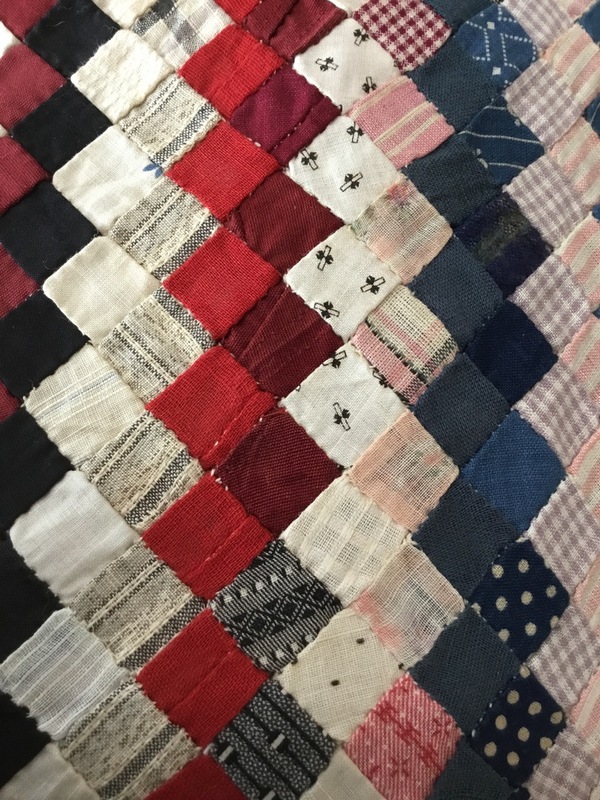 The quilt that was the impetus and inspiration of the Dear Jane book by Brenda Papadakis. 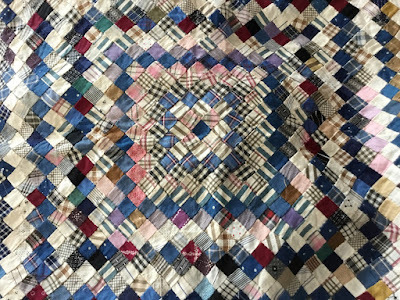 Center of the antique postage stamp quilt. What was going through this quiltmaker's mind as she worked on this project? 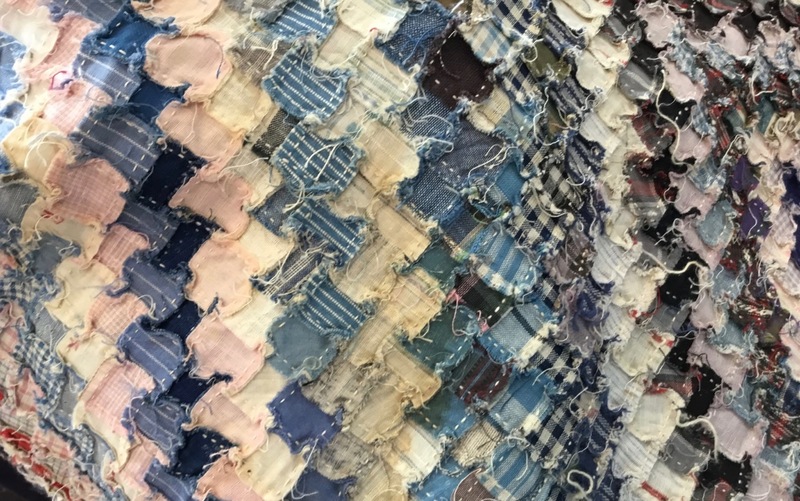 Were the fabrics from personal and family clothing? 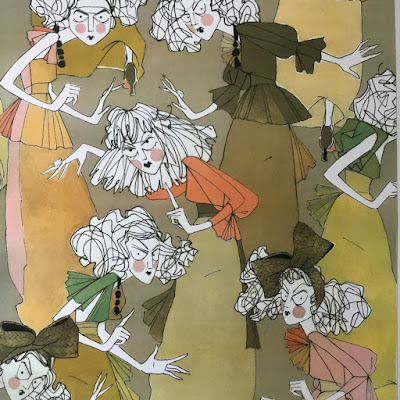 Did she collect scraps from other places (fabric mills, perhaps?) or from friends or neighbors? What was happening in her life during the assembly process? Back of the quilt top showing the hand stitches. If only these quilt tops could talk.